“Spurs set to beat Barcelona to Dutch wonderkid Frenkie de Jong,” screamed EuroSport on November 16. 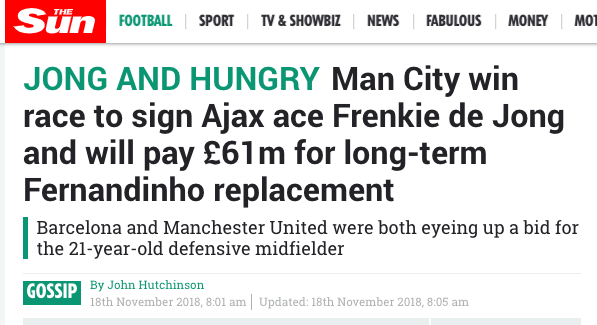 Two days later, the BBC tells us Frenkie de Jong is on his way to Manchester City. The Mirror says Manchester City “have beaten Barcelona” to the signing of the Ajax and Netherlands midfielder. Manchester City “have blown the competition out of the water”. The Express agrees: “Barcelona and Tottenham STUNNED as Manchester City win £61m Frenkie De Jong race.” The Sun also agrees: “Man City win race to sign Ajax ace Frenkie de Jong and will pay £61m for long-term Fernandinho replacement.” We’re told Barcelona and Manchester United were both ready to bid fo the player. They just never got round to it. And then you realise it’s all utter tosh. The Sun admits as much: “De Jong is believed to be keen to work with Guardiola and would favour a move to join the Spaniard rather than across town at Old Trafford.” So nothing is agreed. It’s rumour. There will be “a potential summer bidding war for the midfielder”. Why the BBC, which runs fact-checking news segments, features this utter balls as fact is lamentable. It doesn’t need to compete commercially with the tabloids in a time of falling newspapers circulation, so why does it bother?